Detailed descriptions and examples of financial statements like profit and loss, balance sheet, and bank reconciliation. A must-read for any small business owner who needs to make sound decisions based on accounting records. Financial Statements tell a story, and when that story is about your business, you don't want anything to get lost in translation. To help you succeed, here are a few quick explanations of common financial statements and reports you'll receive when you BookkeepWithUs. Also known as a Profit & Loss (P&L) Statement, or Operating Statement - This financial tool gives you a monthly breakdown of your sales, how much it cost you to make those sales (Cost of Goods Sold), and details what your expenses were for the month. It's great for determining things like: Are your production costs too high, are your margins too low, and most importantly, are you're making or losing money each month. The Balance Sheet is like a snapshot of your business' overall health at a given time. It displays all of the company's Assets, including Cash, how much Inventory it has, and how much income it's expecting in Accounts Receivables. On the flip side, it also displays your company's Liabilities, including money it still owes to suppliers (Accounts Payable) and Accrued Expenses. Lastly, the Balance Sheet includes a category called Owner's Equity, of which, it's content varies based on your company's entity (Corporation, Partnership, etc.). Balance Sheets are a great way to see how well a company is growing, financing it's operations, and distributing money to it's owners. By comparing several Balance Sheets taken over a period of time, you'll be able to paint a good picture of a company's performance & trajectory. When this form is done correctly, the company's Total Assets will be equal their Total Liabilities & Owners Equity, hence the name Balance Sheet. Learn more about how your balance sheets work click here! Also known as the Statement of Cash Flows, this financial tool essentially displays your company's ability to collect and maintain enough cash to pay it's upcoming bills. The Cash Flow Statement can be broken down into three primary categories. The first is Operating Activities, which simply carries over the activities that were reported on the Income Statement under operating income or expenses. The second category is Investing Activities, which are all cash transactions used to buy or sell long-term assets. Think of these as the company investing in itself. Lastly, you'll find the Financing Activities category, which includes all cash transactions that affect long-term liabilities and equity. Whenever long-term debt or equity is involved, it is considered a financing activity. Learn more about how to manage cash flow by clicking here. This is the act of reconciling your numbers. Think of it as double checking your 'books' for accuracy. It's the careful comparison & proof of your bank account statement with your checkbook balance each month to ensure you are working with the correct total. If the totals do not match up, then there may be some transactions missing from your records. In which case you will need to meticulously go through all of your transactions to see what's missing. Pro tip: Hire a bookkeeper to do this instead. A General Ledger Report is a record of the dates, check numbers, payees, and amounts of all expenses within each of your business accounts. Whether you prepare your records by hand or by using an accounting software, this report will provide you with the assurance that your reports have been properly prepared. Sometime referred to as the Common-Size Analysis, This report shows the relationship of each item of the financial statement to a base amount on the same statement. This may sound confusing, but it's much simpler to understand when presented visually. 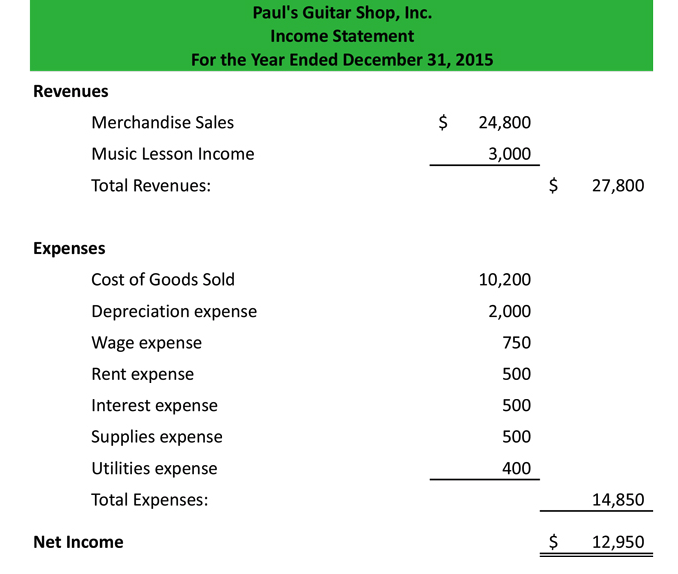 For instance, take a look at the Income Statement to the right. You'll notice that the percentage at the top right hand corner next to the total revenue is at 100%. This is because they're using Revenues as their base number. Directly below that, you'll see the Direct Costs. Notice how the percentage on the right of that number is 60%? This is because their Direct Costs take up 60% of the total revenue they generated. If you look all the way towards the bottom, you can see that their Net Income is 5% of the total revenue. In other words, out of all the revenue they bring in, 5% of it ends up going into their Net Income. This is a great way to analyze where your income is being allocated, as well as compare your performance to the norms within your industry. Sometimes referred to as Trend Analysis, this report compares the financials of one period against the financials of another period. It's used to compare your company's performance over time in order to see if it's improving or declining. If you look at the example on the left, you can see it's comparing a Balance Sheet from December 31st, 2014 to a Balance Sheet taken on the same day in 2013. The two colored columns on the right side show the amount each number has increased or decreased, as well as the percentage it's increased or decreased (numbers in parenthesis mean they've decreased). By looking at this report, we can see that on December 31st, 2014, this company had $5,000 more Cash than it did on the same day in 2013. Which is a 17.86% increase. This would indicate that from a Cash standpoint, the company has improved from where it was a year ago.